Once you have your mid mod mad pad up and running, it’s time for some tunes. We’re guessing that most lovers of vintage homes also have a hankering to hear musical favorites the old fashioned way, too — on incomparable, scratchy vinyl. Good news: Vintage LPs can generally be found very inexpensively at thrift stores and estate sales. And more good news: The album cover art may be as good as — or better than — the music. 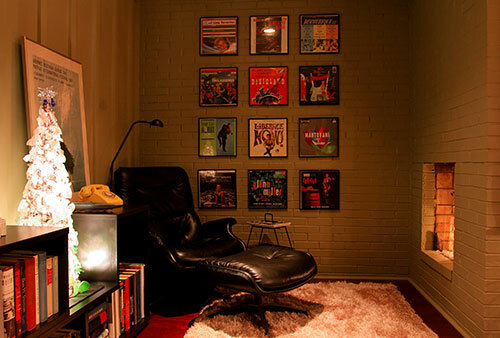 Yes: Displaying album covers as art on your walls can make for a wonderful wall display that reflects your unique vibe. Even more so, because you can periodically swapped out the LP covers to suit your mood. Above: Readers Drew and Eric have used their record collection fill a wall in their cozy reading nook — and add some hip color to the space. 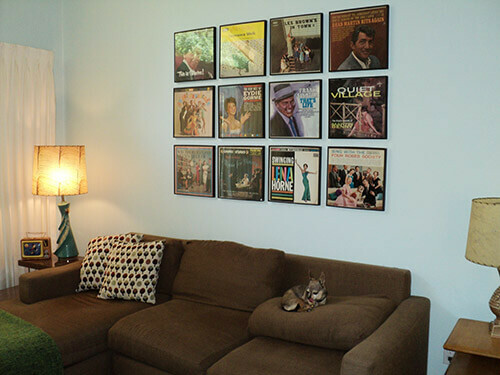 Read on to see how seven more Retro Renovation readers have used records in their decor. 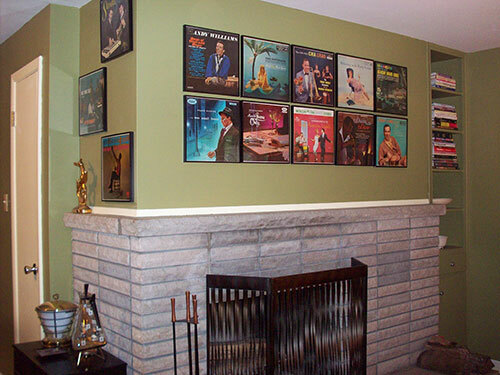 Above: Reader MidCenturyThriftyGal has grouped her collection of framed records over the fireplace — and also around the corner. When you hang your album covers tightly together like this, the grouping reads as one large piece of art. The options for making groupings of records are endless. 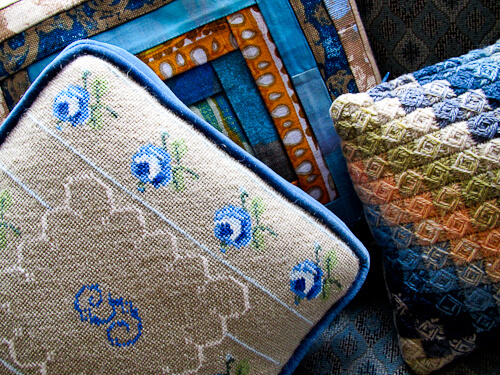 Since records are all uniform squares — it is easy to arrange them in patterns — which can create a variety of looks for your walls. The variety of colors, designs and subject matters on vintage album covers vary widely too — so no matter your taste, you can curate a collection that will complement — or stand out from — your surrounding decor. Readers Rob and Julie have allowed a little more space in between record frames in their grouping. Combined with the more subdued color schemes of the records they chose to display — they achieve a somewhat calmer “piece of art” — their little pup looks like he is ready to take a nap. 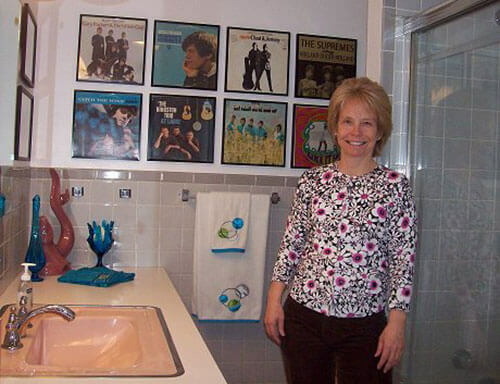 Reader Jill used a similar amount of space between her records — all Beatles — in her Beatles themed gray and pink bathroom. Note, we’d guess that the humidity in a bathroom might do damage to album covers, even when they are encased in glass — or especially when they are encased in glass — over time. So, best to check the market value of your album covers first. 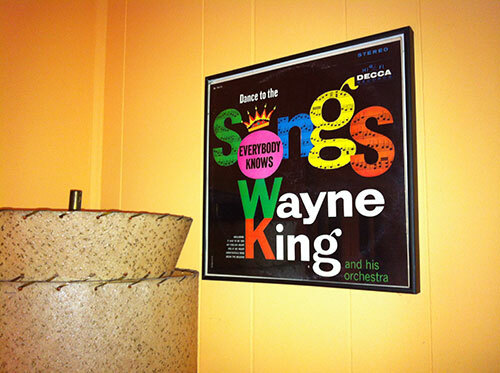 Album cover art is a collectible, and some are very valuable! 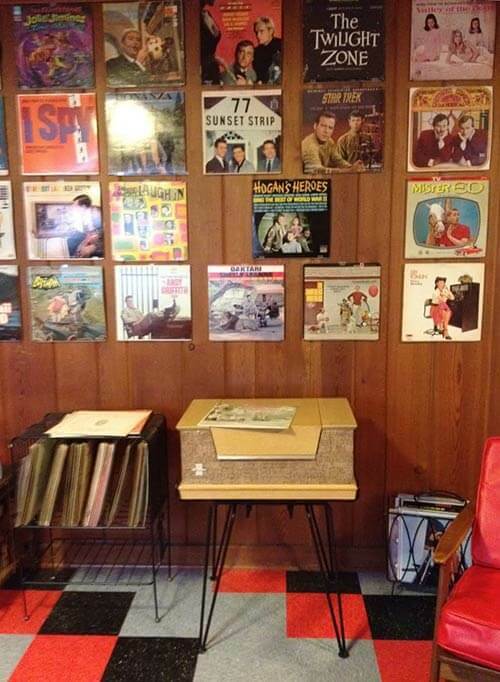 Reader Uncle Atom tacked up his records on the wood paneling in his rec room — with a vintage turntable close at hand. His colorful and kitschy arrangement of records goes well with the pattern on his floor tiles — and the subject matter of the albums he chose to display add a youthful energy to the space. 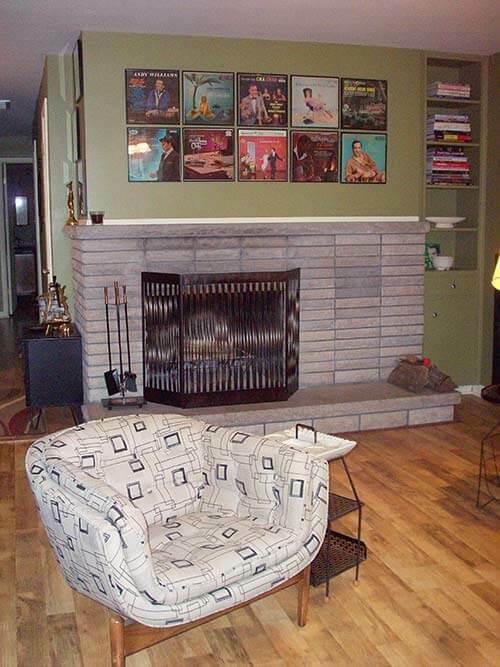 This reader has used albums to add color to their otherwise neutral space. The wider spacing allows them to fill more wall space and spread the color around for maximum impact. 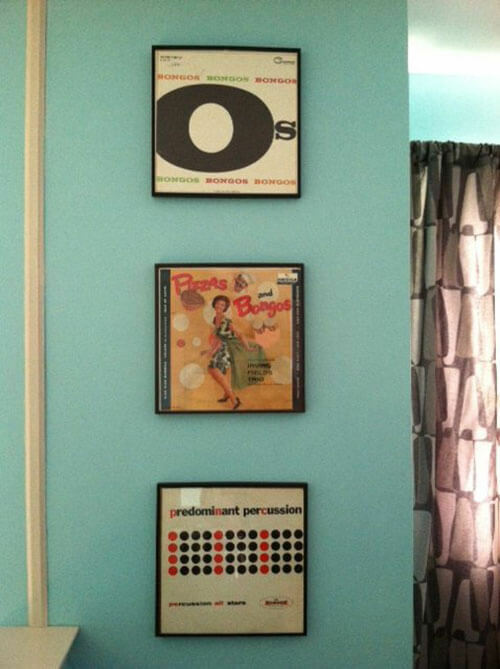 Above: Reader Andrea’s album art display has a theme — it’s a “bongo wall”. 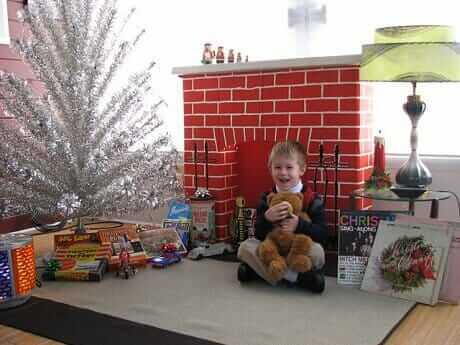 Very clever! Instead of hanging multiple record albums together in a group to display as art — reader Tina has selected a favorite record to display — letting it stand alone. 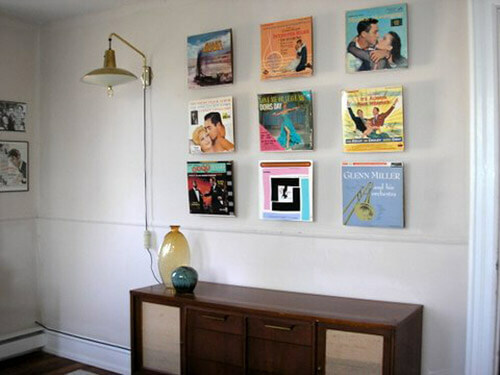 Whether you choose your records to exhibit based on your favorite genre or artist, or simply for the color of decorative nature of the cover design — hanging framed vintage record albums make a great piece of art in a mid century styled home. Readers, do you display album cover art? Do you have design tips for others who want to do the same? I used a combination of framed album covers and photos on a small corner wall in my living room. Of course, I am more of a jazz guy, so my albums and photos are June Christy, Chris Connor, Anita O’Day, Dean Martin, etc, etc. Endless possibilities and a great way to display and protect your album covers. You can also buy vintage record albums framed and ready to hang on the wall at http://shoplakehavasu.wordpress.com/, in case anyone is interested. i need suggestions on making copies of old record album covers to be displayed in location where i don’t want to leave the original. I don’t understand your question… can you elaborate? My boss has over a 1000 old lp’s he would like to display them for the public in an covered but yet open to weather building for viewing. he wants to make copies of these in a poster style or framed on good paper that would hold up to the weather. I think you need to consult with a printer on this. My first thought is to print them on vinyl – but a printer will know. Good luck.